Fostering the development of important science skills is an ongoing challenge. Students should be given opportunities to solve problems, think creatively, experiment, and work with data throughout the school year. The Invention Convention is an event that gives students an opportunity to demonstrate these skills independently as they invent a new product or process. 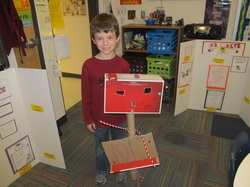 The Invention Convention can be a classroom, school, or districtwide science event. This science event is designed to encourage students to apply basic science skills in a creative and productive manner. Participants are encouraged to identify a need or to solve a problem by following the same steps and patent application procedures that an inventor would follow in patenting an invention. Once a need or a problem has been identified, students are directed to use problem-solving and creative-thinking skills to invent a product or process that would fill the need or overcome the problem. Communication and research skills are also greatly enhanced throughout the invention procedure. The suggested procedure for the Invention Convention involves the following five basic steps. *Click on the picture above to see additional Invention Convention photos!